Yamaha is coming to market with a new "twist" on subwoofers that is designed to get deeper, louder bass from a smaller enclosure. Yamaha Just introduced two new subwoofers that offer exceptional bass response to home audio systems for music listening and movie enjoyment. The new NS-SW300 and NS-SW200 models integrate Yamaha's exclusive Twisted Flare Port technology that diffuses the vortex of air generated around the port to reduce extraneous noise. The result is deep, rich low frequency sound. The quality and performance of the 10-inch, 250-watt NS-SW300 and 8-inch, 130-watt NS-SW200 subwoofers reflect Yamaha's long history of manufacturing the finest studio and home entertainment audio gear. The subwoofers also employ Yamaha's Advanced YST II technology, which combines negative-impedance and constant-current principles to drive the speaker cone in a more linear motion for tighter control. The high-efficiency amplifiers deliver stable power output while minimizing power consumption and heat production. "The combination of Twisted Flare Port and Advanced YST II technologies place our NS-SW300 and NS-SW200 subwoofers amongst the best-in-class in terms of sound quality, performance and efficiency," said Bob Goedken, general manager, Yamaha Corporation of America, AV Division. "In addition, the elegant piano finish cabinets of these subs add an attractive complement to the esthetics of any room." The Yamaha NS-SW300 and NS-SW200 subwoofers will be available in December for MSRPs of $549.95 and $449.95, respectively. 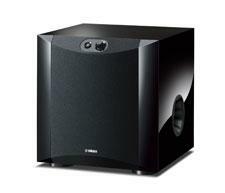 • Read more subwoofer reviews fromHomeTheaterReview.com's writers. • See more reviews in our Floorstanding Speaker and Bookshelf Speaker sections. • Explore pairing options in our AV Receiver Review section. SVS Announces Black Friday Deals on NSD Series Subwoofers Priced at $399 and $499 each, these subwoofers are available in limited quantities, and when they're gone they're gone.